Steem.Camp is meant as a self-organized camping event. If you have been camping before, you will understand how camping activities hugely depend on the weather conditions. Therefore, we simply can not plan every detail ahead of time. Even though we will try to prepare for all circumstances, we might have to improvise. That is the beauty of camping. - How much will it cost ? Camping ( to pay on site ): 44€ per Person. This includes 4 nights of camping. Tickets: We will sell a limited number of tickets for 60 Steem. The tickets are necessary to plan for the right number of guests. 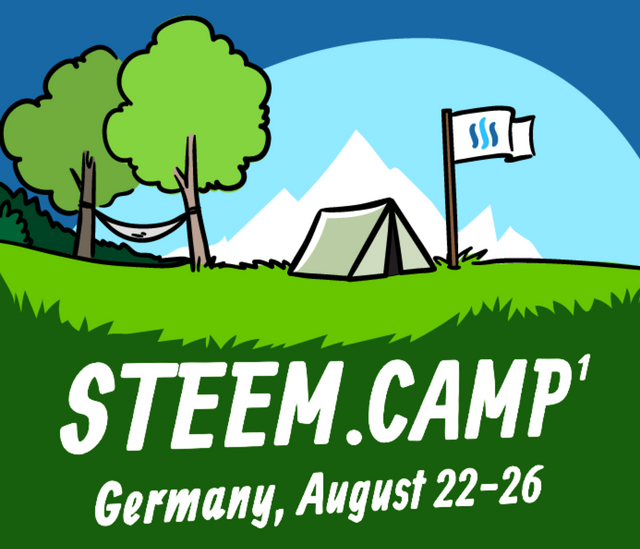 The @steem.camp team will try to direct all funds back to the event or the guests. Since we have little experience and we do not want to run into too much personal costs, we will save some Steem to cover unexpected expenses. If we happen to generate a profit with this event, we will try to spend those on future camps. We will have our own Getränkewagen, where you can buy cold beverages of all kind. As mentioned above, we will organize shopping trips to the nearest town and you can order your own food for cheap. Additionally we will arrange community cookouts and can probably provide breakfast and coffee. - What is the WIFI password ? There will be good LTE coverage, but no WIFI. We'll take care to share LTE bandwith by creating hotspots with our phones. - Do I have to bring a tent ? There's plenty of space for your tents, cars and mobile homes. Furthermore we have reserved four tipi tents (in case you just come with your sleeping bag) and an spacious event room. Of course there is a BBQ area. - I can not afford a ticket, what do I do ? We will reserve some tickets as wildcards. These can be won through competitions and other community events. Please join our Discord and let us know. - Can I bring my dog ? It's possible to bring your dog - but please talk to us beforehand. - Do you offer rideshares ? - Are you associated with @steemfest ? No. @steemfest is run by @roelandp and we are not even trying to compete with him. @steem.camp is an entirely different event. We highly recommend you to follow @steemfest and join the next one. The last two were incredibly well organized and a lot of fun. - Will you come to my country ? At the moment, we are busy with our first event, but will look at other countries than Germany for the next one. Please join our Discord if you can help us organize a @steem.camp in your area. - When does the ticket sale start ?